Education in the present era gives utmost priority to foresight. They teach you to think ahead and submit your soul to slavery for the purpose of industrialisation. If you see through this tomfoolery, rejecting subjugation then you’re labelled a slacker who doesn’t know what’s essential for survival. The hypocrisy becomes increasingly evident when the masters overseeing the industrialisation conveniently pay no heed to warnings pertaining to our finite resources. The war over oil comes to mind as a shining example of this inefficiency in societal management. Contrary to popular belief, the human body is not made up of oil. Another liquid functions as the fundamental building block of life throughout our rocky planet. Water, as I had already mentioned in a previous post, is the front-runner for displacing gold as the most precious substance on the face of the planet. Yet, we consume this precious life-sustaining ambrosia without any concern of what it might entail for the coming generations. Life on earth is a never-ending relay system of handing over the planet, generation to generation, and it is always the prerogative of the older generation to give back a functioning planet to their children. This foresight eludes the present era. We have deemed space exploration too costly, instead focusing on military spending to sate our geographical narcissism. We are fighting over a grain of sand while the entire beach sits empty. Owing to this geographical narcissism we live in an age where even though blessed with intelligence, certain segments of the elite society considering it fitting to utilise their resources to construct golf courses in the middle of deserts. This is made possible by diverting water supply towards these arid regions. This happens in a world where 1 in 8 humans don’t have access to clean drinking water. Las Vegas appears to be the first casualty of this mindless hedonism with its water-free era slated to begin in 20 years. The middle-east is another hedonistic civilization that comes to mind. While the privileged few inland have usurped the right over this precious resource, Neptune is crestfallen at the destruction inflicted upon his dominion offshore. The oceans function as the ultimate car-trunk. You can hide your dirtiest of secrets inside it without anyone ever finding out about it, but for Neptune and his children of course. Coupled with this is the fact that the oceans act as a sponge and absorb some of the excess Carbon-dioxide from the atmosphere resulting in ocean acidification. The acidity of global surface waters has increased by 30% in just the last 200 years. The rate at which this is happening is unprecedented. It is the duty of inhabitants around the globe to pull their government’s head out of the sand forcing open their shut eyelids making them see the inevitable future. Nationalist jingoism can only get you so far. There comes a time when humans will have to transcend petty geography bringing about a global conscience supported by immense local kinship. This year we witnessed the arrival of the seventh billionth earthling. Global population continues its exponential growth voraciously. What we find ourselves muddled in is a paradox of human welfare and destruction. The trouble is that there is no consensus on this. The planet hasn’t tried to support this many of its children at the same time. As with any parent, she gives us free will and resources to accomplish what we think is right. Self-harm is categorized as prudent morality, or in this case, unprudent. The majority follow the conventional morality and stick to the program of unsustainable immediate growth all the while grabbing more and more of the resources. How much is too much? Almost 97% of this is saline and hence not suitable for drinking. Of the drinkable freshwater, 68% is locked in ice and glaciers, 30% is underground and the rest is found on the surface as rivers, lakes or swamps. 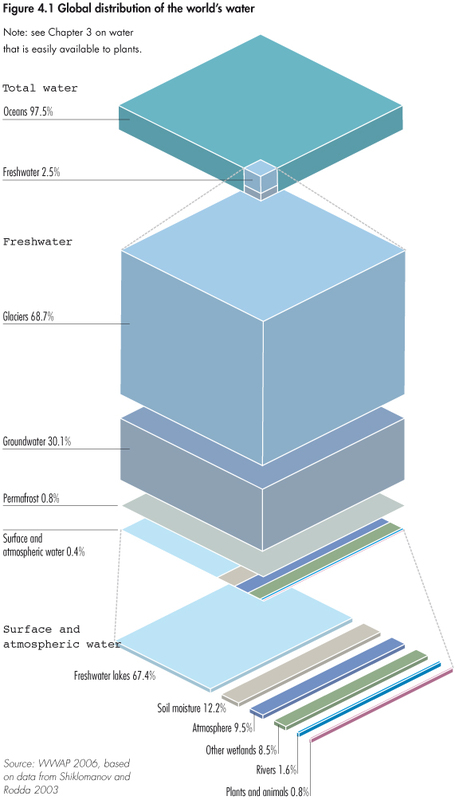 The freshwater on the surface amounts to just 1/10,000th of one percent of the total water. The global population growth is apparantly on a decline but the people are indeed living longer. And we all know that none of the nation states are ever going to put an end to human reproduction. What we have here is a taut struggle between the exponential growth of users and an irreversible eradication of a finite utility asset. The asset just happens to be a life-sustaining resource, more valuable than gold or currency ever will be.